Early in the afternoon the weather took a turn for the worst and the winds started blowing ruthlessly. At first it seemed like nothing out of the ordinary and signaled that another period of rainfall was coming in the Thai rainy season. However, as the winds picked up speed, trash and bits of trees started being thrown around, it was obvious that these winds were stronger than usual. People started running around trying to escape the coming rain while avoiding the dust whipping by. It began to rain shortly after and the winds kept up. Potted plants were tipped, branches were torn off trees and then the electricity went out. The rain didn’t continue for very long and the whole thing took place in about an hour. In that one hour though, a lot of damage had been done: several roof tiles had been torn off the school’s roof and one hit a car, leaves and branches were strewn everywhere and a tree had fallen across the road that was blocking traffic. The electricity did not come back by the time I left the school. I later found out that a sign had fallen down onto a roadside noodle shop that is on my way home. A woman got pinned by the large, metal sign in the building and was crushed to death. Around the city of Bangkok other signs had fallen and many trees as well. Of course, the storm resulted in bad traffic as motorists rushed home and had to avoid routes with repairs in progress. The best course of action for the rest of the day seemed to be to go home after the wind and rain stopped. The placed I most like to be if another storm occurs is within a large, sound building. Hopefully, the roof doesn’t blow away. It is forcasted that heavy rain storms will persist for the next three days. Memories of summer camp in Canada came to mind when I stumbled across an archery range next door to my work place. In the Meng-jai area, on Soi Sahakarnpramoon (in the same soi as the Cambodian and Laotian embassies) there is All-Star Sport Complex which caters to upper class golfers. On the same property are restaurants, car wash, tennis court and swimming pool. Going to get my car washed one day, I walked over to the Archery Thai to see what it was all about. The lady behind the counter was very informative and told me the rates, cost of lessons and showed me some of the equipment. A friend of mine became interested when he learned of the archery range and we have since bought bows with the intention of taking 10 beginner classes. There is a large archery community, called the Thailand Outdoor Archery Club, that comes to the range to practice and compete. Before getting serious about archery, Archery Thai recommends a 30 minute Discovery Class where you get one-on-one instruction with a coach to learn the basics of shooting a recurve bow. 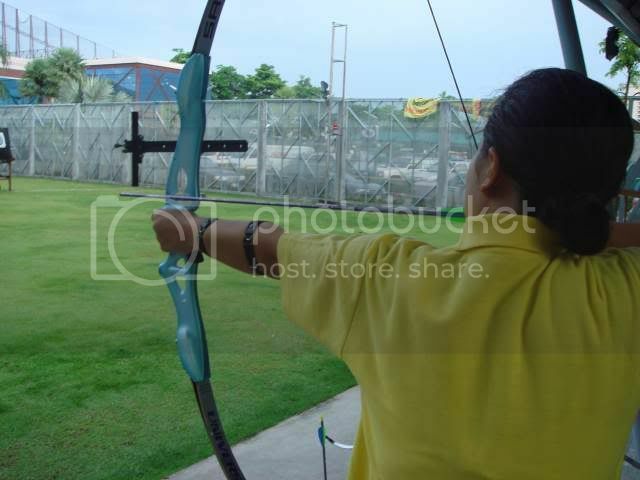 This session costs 250 baht and includes the cost of the instructor and bow rental. For the 10 hour Basic Archery Course I mentioned earlier, it is 5,000 for one-on-one instruction and 3,000 baht for two students to share an instructor. For the 500 baht saved per person per 10 hour course, it seems reasonable to go for the one-on-one instruction. The cost of the 10 hour beginner course does not include the cost of the bow rental. 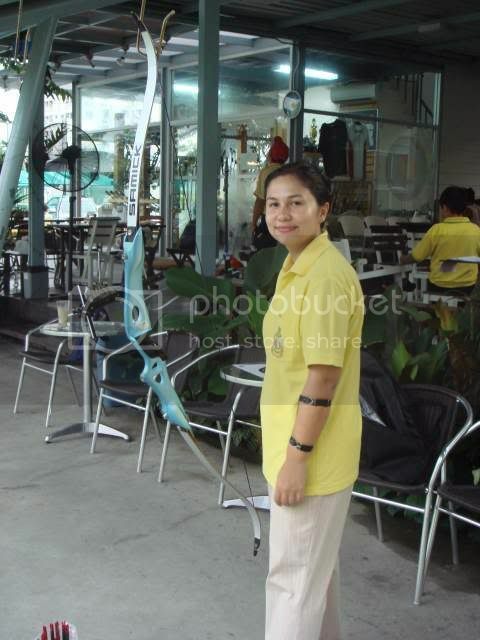 So if you don’t have your own bow, you will have to rent one at 200 baht per hour. After completing the Basic Archery Course there is a Bridge Archery Course which continues to work on the fundamentals of archery and improve the archer’s skills. The cost of the Bridge Archery Course is the same as the Basic Archery Course. 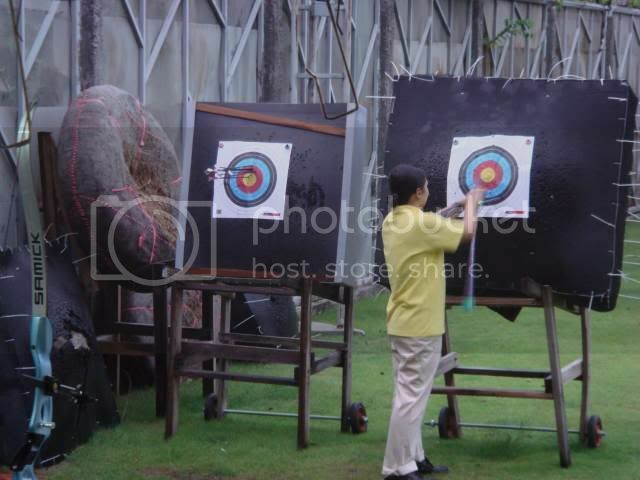 Normally, if you have your own bow and are just coming to shoot some arrows, the cost per hour to use the range facilities is 40 baht/hour during the weekdays and 60 baht/hour on nights and weekends. There is also a membership program which is 600 baht per month but allow unlimited use of the archery facilities and other benefits. 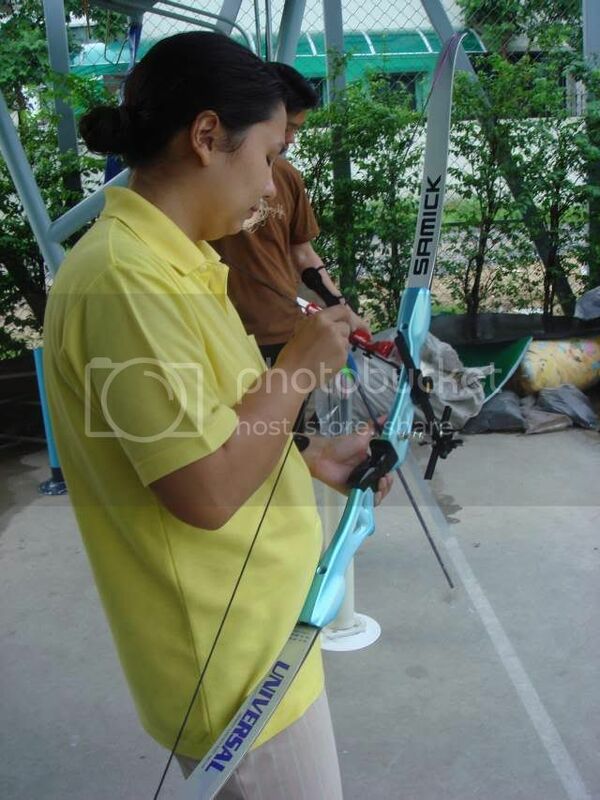 If you are looking to buy a bow and start learning the basics of archery, Archery Thai also has many people able to give you advice and tips on picking a bow, arrows and technique. The people that I have met there have been friendly and many of them can communicate well in English. My instructor was able to teach in both Thai and English. When it came time to buy a bow, there were packages of Hoyt and Samick bows available for starter, mid-range and high range bows. The staff at Archery Thai seems more than competent and answered all of my questions. I have yet to start my Basic Archery Course and still need to pick up the Samick bow I ordered last weekend, but I can’t wait to start shooting arrows on a regular basis. Bangkok is a megatropolis that greatly contrasts the traditional Thai lifestyle that still persists in the countryside. But, right in the middle of the Chao Phraya River you can find a small haven that is a thrown back to a forgotten time in Bangkok’s history. On any weekend, hundreds of Thai tourists visit Koh Kred. This small island (4 km perimeter) is located in Pakkred and is known for its clay pottery. Visitors can come via river or car to the island and spend several hours taking in the history, wooden Thai houses, artistry and craftsmanship. Like most Thai tourist destinations, food and sweets abound and you can’t go 2 meters without being tempted by the next food stall. 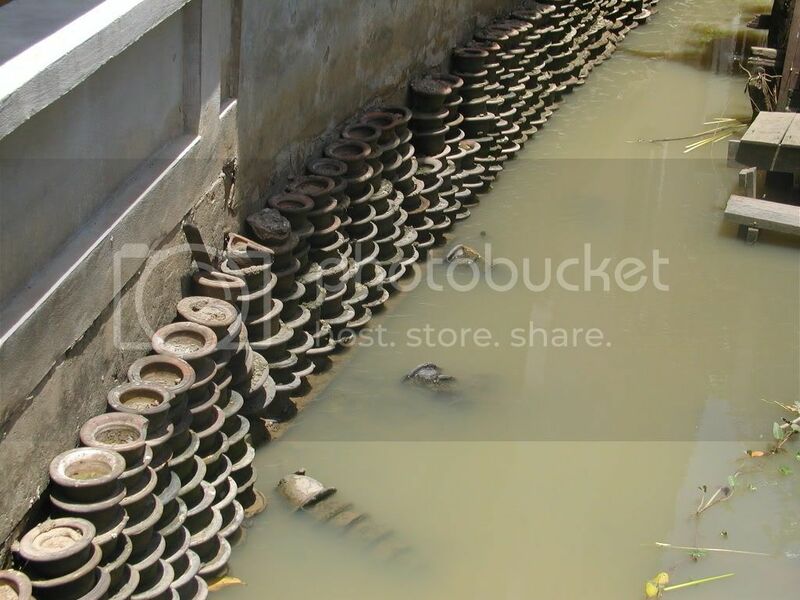 Koh Kred is covered in Wats and as you walk along the perimeter of the island you will past several of them. 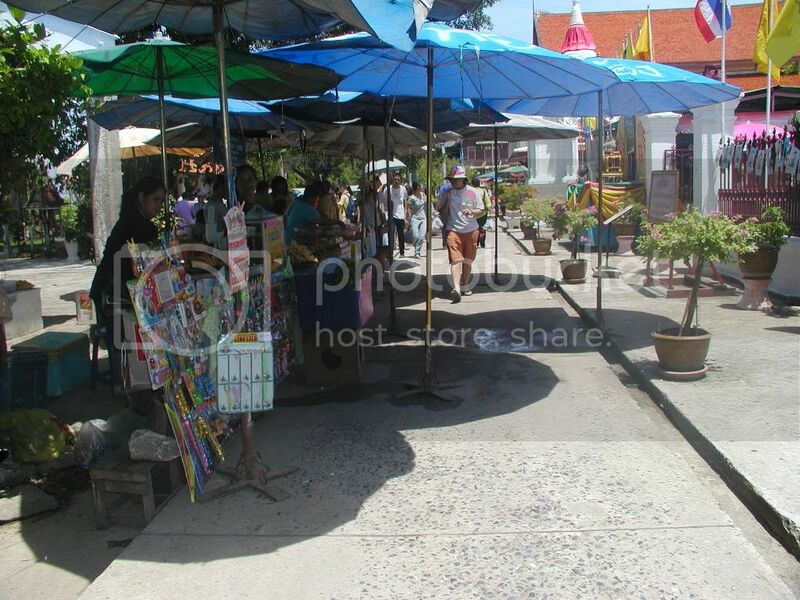 The main attraction at Koh Kred is the opportunity to see potters work at their craft. 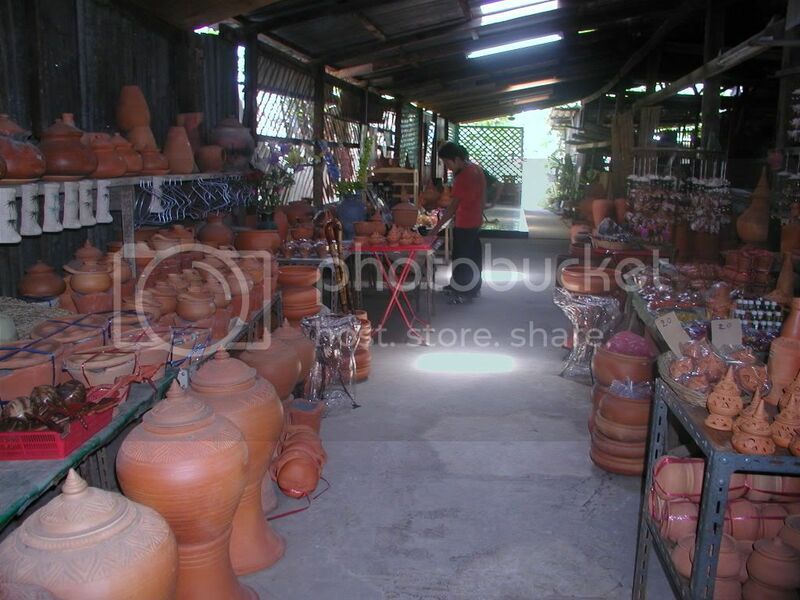 There are working pottery shops that permit visitors to view the process of making clay pots and sculptures. The large kilns are made of clay bricks and are heated most of the time. 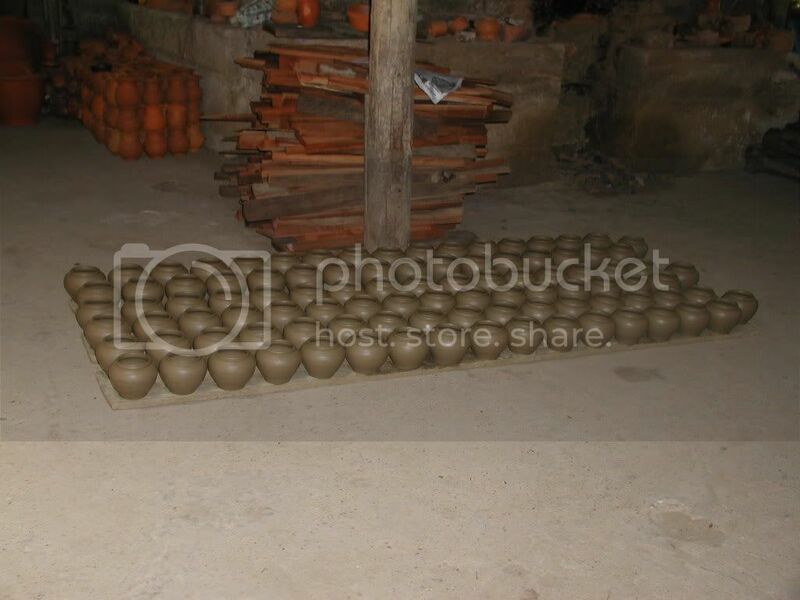 In an effort to cool down the pottery shop, sprinklers are placed on the roof and the water trickles down constantly. This island also floods frequently during the winter season when the Chao Phyra River has a high water level. Many of the vendors stated that the walking path through the shops was completely flood. The locals had to use boats to move in between houses, go to school and work. 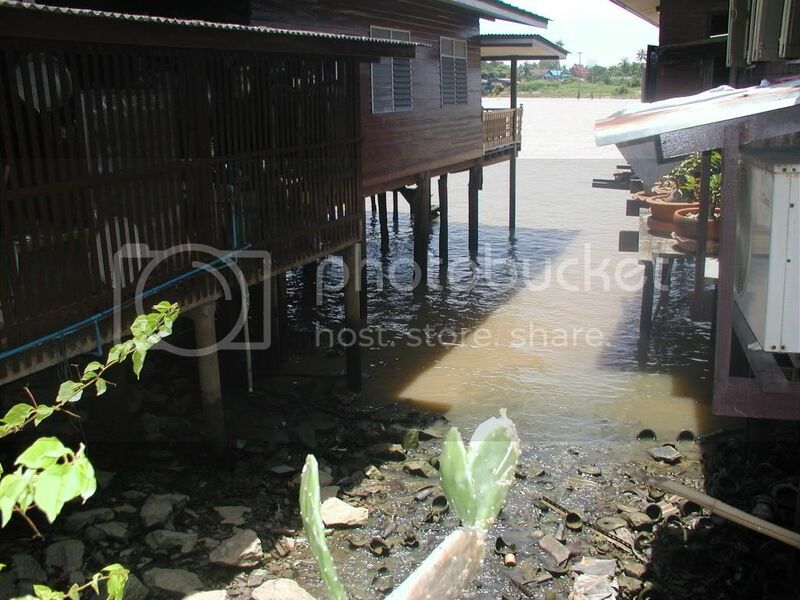 At these times, tourists do not visit Koh Kred and their main source of income dries up until the flood waters recede. Koh Kred is a wonderful day to spend a weekend morning. Visit early so that you can experience the artisan atmosphere at Koh Kred and escape the midday heat. The potters in the pottery shops do go to lunch at noon and you’ll want to see the pottery demonstration when they are around. There is plenty of food and drinks available to satisfy your hunger and thirst. I recommend that you have lunch on the island before going about the rest of your day and head off to your next destination. 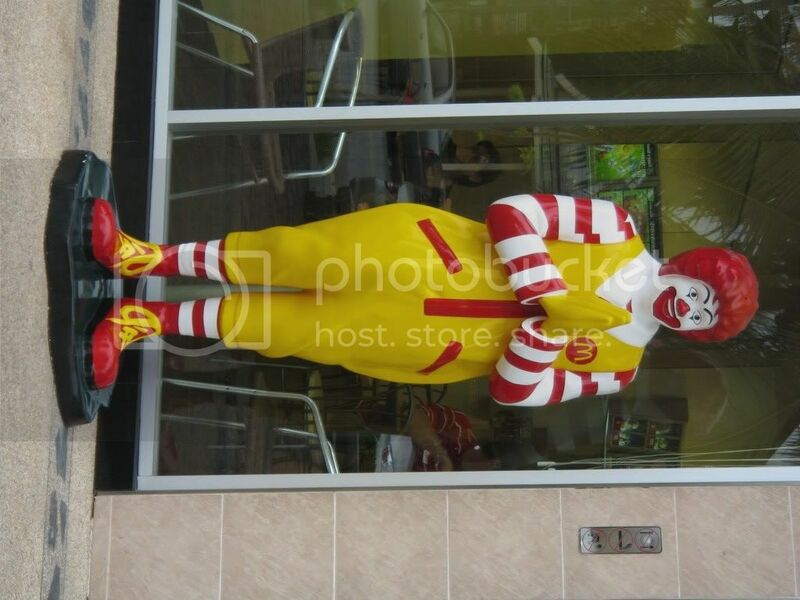 Ronald McDonald really knows how to blend into different cultures. In America you will see him at McDonald’s branches throughout the country waving a friendly “hello” according to American custom. In Thailand, Ronald is a culturally aware company mascot and instead of his hallmark wave gives a very Thai “wai” instead. Although I don’t make it a habit of going to McDonald’s and try to avoid fast food joints as much as possible, many tourists might enjoy “a taste of home” while in the Land of Smiles. Compared to Thai food, McDonald’s is a bit expensive and other fast food franchises such as KFC are more popular with the Thai people. However, you do see quite a few McDonald’s around and there are over 100 locations in Thailand. Many people find it a convient place to meet and the younger crowd like to hang out and eat there. The average cost of a meal at McDonalds is around 80-100 baht. Every item on the menu is a bit shrunken in size compared to the American version, which is more than you really need. Some items are very cheap like sodas, floats, cones, sundaes and pies (9-19 baht). The burgers cost 19 baht and up. The Thai McDonald’s menu offers the Pork Burger, Samuri Pork Burger, Spicy McD, and McFish, in addition to the normal cheeseburger, hamburger, McNuggets and BigMac. Of course, for the kids you have the Happy Meal and typical McDonald’s toys that children as well as adults like to collect. Definitely missing in Thailand is the McDonald’s breakfast menu. One could argue that the Western style breakfast items would not move to the Thais, but Burger King offers their breakfast menu all day. Another theory is that the morning versus non-morning setup would be different for teh kitchen to deal with and so they eliminate this problem altogether by not serving breakfast period. Perhaps it is for the best as nobody needs to be eating greasy hashbrowns and sweet sasuage McMuffins. Another difference between the US and Thai McDonald’s is the avaliability of delivery. This makes sense when you consider the traffic in Bangkok and must really increase sales for those people who are craving some McDonald’s but don’t want to worry about driving there and back. Talk about adapting to a country in order to sell your product. McDonald’s is one company that is slowly infiltrating into every corner of the globe. The National Science Museum, also known as the Technopolis Science Museum, was built to commemorate the 60th anniversary of HM Queen Sirikit. The museum is housed in a cube inspired building which is balanced on its points and made out of fiberglass, steel and glass. The National Science Museum is park of the Technopolis Complex that will consist of the Science Museum along with the Natural History Museum, the Ecology and Environment Museum and the Aviation and Telecommunications Museum. The museum is a short drive from Bangkok in Pathumthani. There are six floors in the National Science Museum which provide hours of topics to explore. 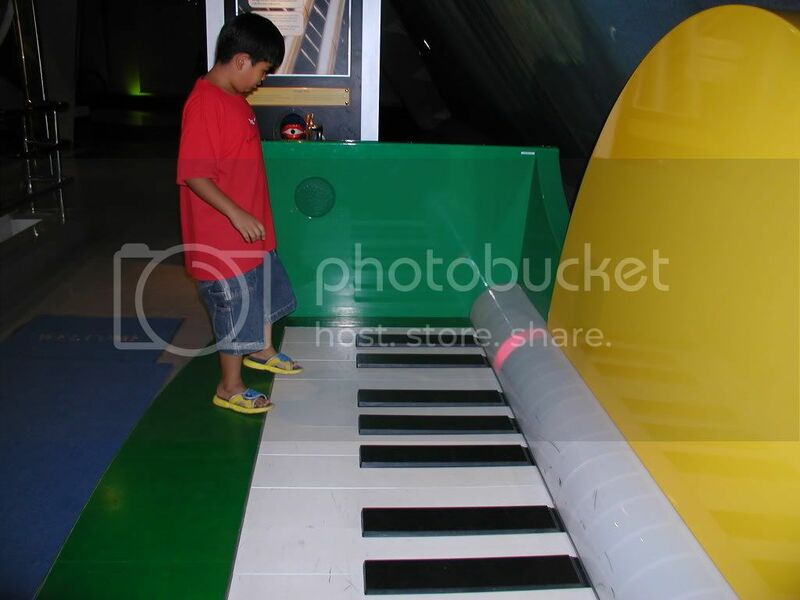 The museum is a great place to learn about science and has many hands-on exhibits that children and adults will enjoy. Give yourself some time to browse through the museum. If you understand Thai, you may want to see one of the science shows available as they are educational and entertaining. History of Science and Technology – origin of Homo sapiens and the progress of science. Basic Technology and Energy – covers sound, math, light, electricity, magnetism, force, movement, resistance, heat, substance and chemical energy, and many other topics. Science and Technology in Thailand – facts about Thailand: its climate, ecology, agriculture, industries, geological features and geography. The first two topics have really dry and boring exhibits and you can go through these floors rather quickly. However, you will end up spending most of your time of floors 3-5 as this is where all of the hands-on and interactive exhibits are. Most of the exhibits are have explanations in English and Thai, so you don’t have to worry about reading Thai descriptions. If you like museums like the Exploratorium in San Francisco in California, you will enjoy these educational and fun exhibits at the National Science Museum. Included in the price of admission is the Natural History Museum, which is on the other side of the parking lot. This museum doesn’t seem finished and there are only a few exhibits. They have a nice display about biological sciences and genetics, as well as preserved specimens. There are a few live specimens in the museum and you can see some of live fish, insects and mammals. To get there: If you are going by car from Bangkok take the Northern Expressway to Rangsit, or the Eastern Outer Ring Road to Rangsit. It is approximately 10 minutes from Future Park Shopping Center. There are signs which direct you to Technopolis Park, which is where the museum is located. Once inside Technopolis, go straight and take the first left. 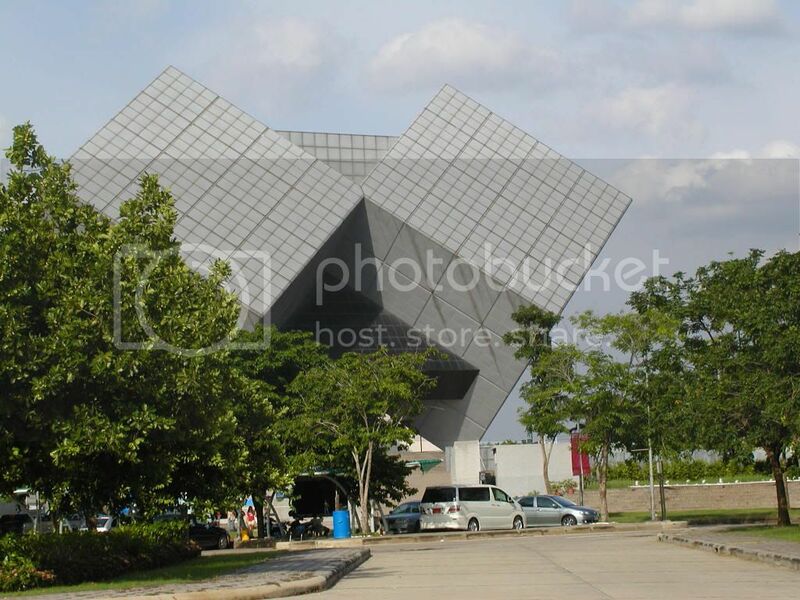 Head towards the cube shaped building and park in the adjacent parking lot. You can also take an air-conditioned bus (no. 1155) from Rangsit Market or Future Park Shopping Center. After a period nothingness, it is time for moviegoers to get ready for a mirad of movies hitting theaters. It is the summer movie season in North America and it is when many movie companies release their summer blockbusters. Recent movies that have been released in Thailand in May and June worth mentioning are Spiderman 3, Shrek the Third, Ocean’s Thirteen and Pirates of the Carribbean: At World’s End. The summer is only beginning and a slew of movies have yet to appear on the big screen. Upcoming movies that will be in theaters over the next few months are Happily Ever After, Ratatouille, Perfect Stranger, Bourne Ultimatum, Fracture, Arthur and the minimoys, Evan Almighty, Transformers and the next installment of Harry Potter. This doesn’t even include the Thai and other foreign movies available in the near future. With the low cost for movie tickets in Thailand compared to countries inthe North America and Europe, it is more than a deal to see these blockbusters with the big screen experience. Seeing larger than life images with surround sound in a darkened theater only enhances the effects created by movie directors and performers to lure you into their fantasy. However with the chill factor in Bangkok’s movie theaters, it’s a good idea to bring a jacket or scarf to keep yourself nice and warm during the hours you’ll spend in the freezing theaters. Otherwise you may find yourself shivering uncomfortably throughout the movie. Also, people in Bangkok rarely get a chance to wear winter apparel. You might as well take the opportunity to wear that jacket that hangs unused in your closet. Driving around on the streets of Bangkok you might spot an interesting phenomenon, a car with a stuffed animal or doll dangling from the back of the car. Many of the hanging dolls are dirty and ragged from being dragged around on the city streets. There is something eerie and morbid about the sight of a child’s toy looking so disheveled.Taxi drivers seemed to be the first group to adopt this practice and it has since spread to the average motorist. Even on a short drive in Bangkok, you are bound to spot one of the hanging dolls. Taxis still comprise the largest number of cars that hang dolls on their bumpers. The question that you are probably thinking is “Why?” For awhile I pondered this myself and although I asked around, no one else seemed to know either. Finally on the Thai news I got my answer. The hanging doll or stuffed animal is an offering to the spirits of those that died in a traffic accident. It is hoped that the spirit will play with the toy and leave the car’s driver alone. This superstition is thought to have originated in Korea. Since Thai people believe that ghost hang around near the location of their death. They also believe that the ghost are waiting to be reborn and may provoke an accident by tricking a driver, especially at night. In light of such superstitious beliefs, it makes sense that some Thais would readily adopt a practice that seeks to placate these devious spirits. Interestingly enough, the news report stated that many people have been adopting the practice of hanging a doll on their bumper without even knowing why. They simply saw others doing it and wished to do it as well. Other drivers get even more morbid and stick disturbingly real-looking fake arms out of their car trunks to shock fellow drivers. Next time you take a drive through Bangkok, keep your eyes open for this quirky sight and we’ll see how long this trend lasts. It has been 9 weeks since I exited the Detox program at Rasayana Resort. Since school has started, many people have been surprised by the change in my appearance. They all want to know my secret. I think that the cleansing program has acted as a catalyst in my weight loss. While both of the people who did the cleanse with me have lost weight and improve their health in other ways, I had the most dramatic weight loss to date at roughly 6 kilograms. The amount of weight lost post-detox is surprising to me as well. In the months after the detox I have continued to each more vegetables and fruits, but I have started having more treats like milk teas and desserts. Overall my meals have been lighter and portions remain smaller than pre-detox. Since the school year started and I have been teaching again, I have had less time to exercise consistently during the week. I manage to do a one hour bike ride on the weekends and some weight training 1-2 times a week. Even at times when I expect no weight loss or even a potential weight gain, I manage to lose a couple more pounds. I really can’t explain the ease at which I am losing weight. I only wish that is was always this easy. Several of the parents at the school have mentioned that they are interested in doing a cleansing program after seeing my results. Since my cousins have not had the experience, the results seem to be atypical. I do think that I have been more consistent in maintaining healthy eating and exercise habits. I am curious to see the results of others who do the cleansing program. I am really glad that I did the detox, even though the experience was rather trying. I never thought that I would do something like colonic irrigation and be able to stick to such a strict diet. Now I know that I have the willpower to commit to a tough routine if I wish to, at least in the short term. I would definitely recommend that people who are interested in doing a cleansing program try it because the results could be more than you hoped for. Most Thai schools have opened for their first semester for about one month now. Our school had a “wai kru” ceremony today. “Wai” means to bow in Thai and it is also involves bringing your hands together as if saying a prayer. Thai culture fosters a deep respect for educators and the “wai kru” ceremony is a brilliant way to start the academic year. The ceremony is very formal and decorative but it also is a vital part of the traditional Thai educational system. The ceremony is held in June on a Thursday. On this day Thai students bring flowers to their teachers as a symbol of their respect and readiness to learn. 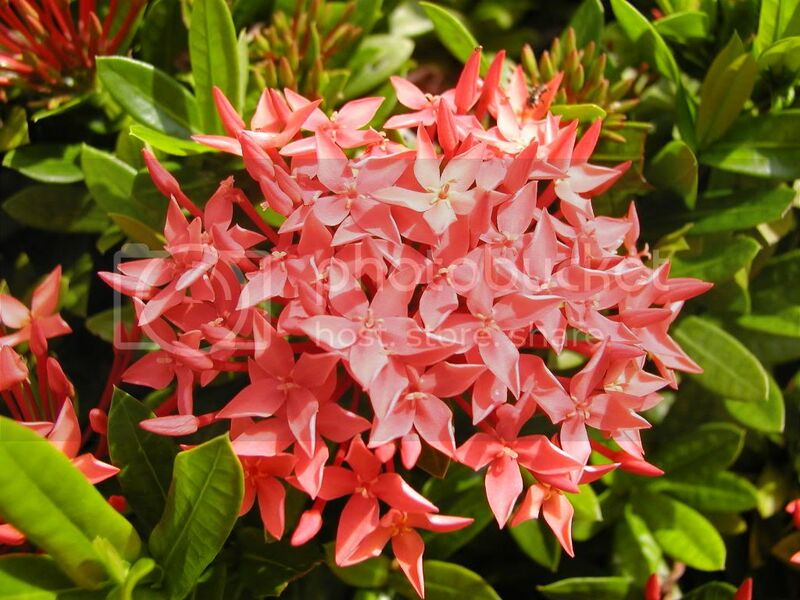 The most popular flower to bring is called “dok khem” (needle flower) because it represents the student’s promise that his/her brain will be as sharp as a needle. Some students also present jasmine garlands. The children bring their bouquets to school in the same fashion that students in the US would bring an apple for the teacher. Schools usually have a ceremony in the morning for the student body to “wai kru” together. The teachers are called to sit in front of the students as the students repeat a Buddhist chant and sing a song that demonstrates their appreciation for the teachers. The students thank the teachers for having taught well in the past and encouraging their good luck in the future. A few non-Buddhist students sat in the back row and only participated in the presentation of flowers at the end. First two representatives from the student body, usually from the eldest group of students, present the most senior teacher with a gift on a gold container. Typically, this would be a stack of books. The senior teacher then uses a chalky past to draw a buddhist symbol on the gift. Afterwards two representatives, a boy and a girl, from each class comes forward to present their classroom teacher with an elaborately decorated “paan,” which is a golden container filled with flowers that the students in the class helped to create. The representatives return to their seats before saying another chant. The “paans” are displayed near the Buddhist alter on the stage. Towards the end of the ceremony, each student must crawl up to their teacher on their knees with their heads down. Then the students bow to their teachers and offer them their individual bouquet of flowers wrapped with candles and incense. The teacher receives the flowers and gives the student advice. Some teachers will also pat the student’s head to encourage the knowledge to absorb into the child’s brain. The flowers from the ceremony were taken by the teachers and staff to decorate their rooms and offices. Finally, a representative of the teachers comes forward to bestow words of wisdom upon the entire student body. This message usually encourages the students to be disciplined, prompt and respectful during the rest of the school year. The students were dismissed after another speech given by the principal about being disciplined and still during ceremonies. There is another day which pays respect to teachers which occurs towards the end of the school year, National Teacher Day. Every 16th of January schools are closed in honor of Thai teachers across the country. The Water Buffalo is a member of the bovine family that is commonly seen in the landscapes of Southeast Asia. Wild Water Buffalo are found in Asia and South America and are the originators of the domestic stock living today. While wild-living populations exist in many Southeast Asian countries, these are believed to be feral domesticated animals or domesticated animals mixed with wild descendants. Wild water buffalo populations are sparse and it is thought that no purebred wild water buffalo exist. There are different types of water buffalo. The water buffalo found in Southeast Asian, China and India are generally smaller than buffalo found in other parts of the world. Water buffalo vary in height, length, skin type, horns, hair and ears. Thai water buffalo are wide backed and have large, protruding bellies. They have a large boned frame with long legs and a fairly long neck. The head is small in comparison to the body. Horns protrude from the head that curve out and upward. Adult water buffalo range in size from 300-600 kilograms. Buffaloes are used primarily as draught animals. 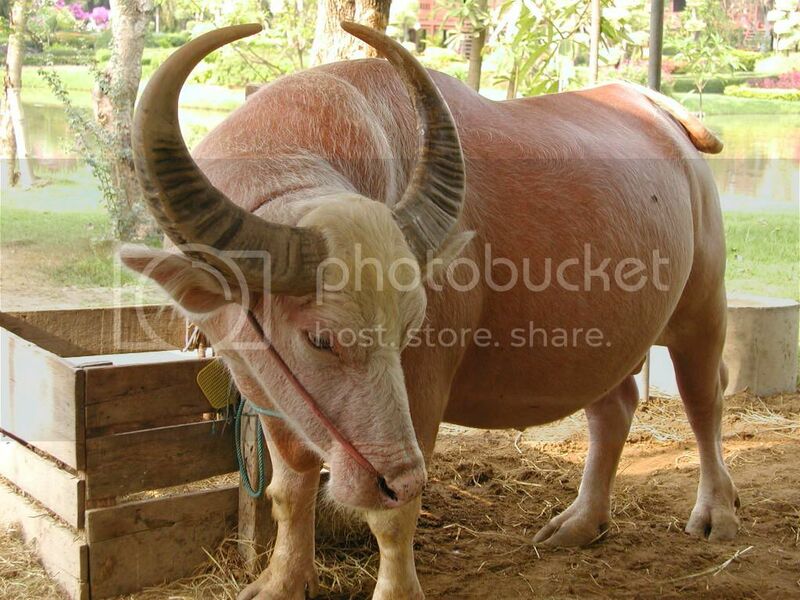 Years ago in Thailand, they were used to pull bullock carts and plow rice fields. Water buffalo have strong flat hooves which enable them to walk through the sticky mud in the rice paddies. Buffalo products such are meat and milk are used as well . The water buffalo also produces copious amounts of dung which is used as fertilizer and as a fuel when dried. There are also annual water buffalo races in Chonburi and some Southern islands have water buffalo fights. As a large rice producing country, Thailand formerly had the highest water buffalo population until the last decade. This is the result of motor driven tillers or “mechanical buffalo” have replaced the water buffaloes work in many rice paddies. This machine is a small, hand guided tractor with large paddles on its wheels. Although there numbers are diminishing, they can still be found in Thailand’s countryside. The Buffalo Villages Project is found in Suphanburi. 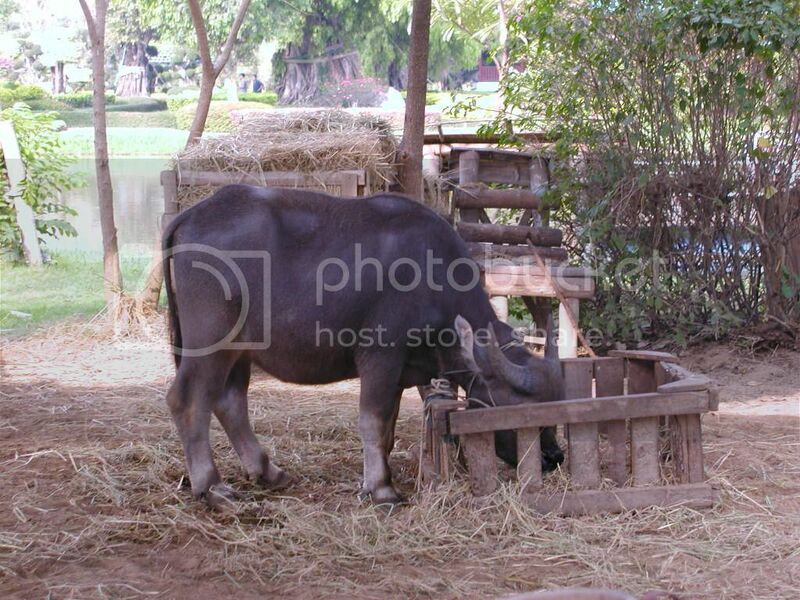 Many water buffaloes are kept at the village. The project was created to help conserve and develop the Thai water buffalo, as well as to remember the value of the buffalo to Thai farmers. The 70 rai center features a water buffalo show, several varieties of buffalo including albinos and dwarfs, a traditional Thai village, display of ancient farming techniques, Baan Thai resort, ostriches and native birds. 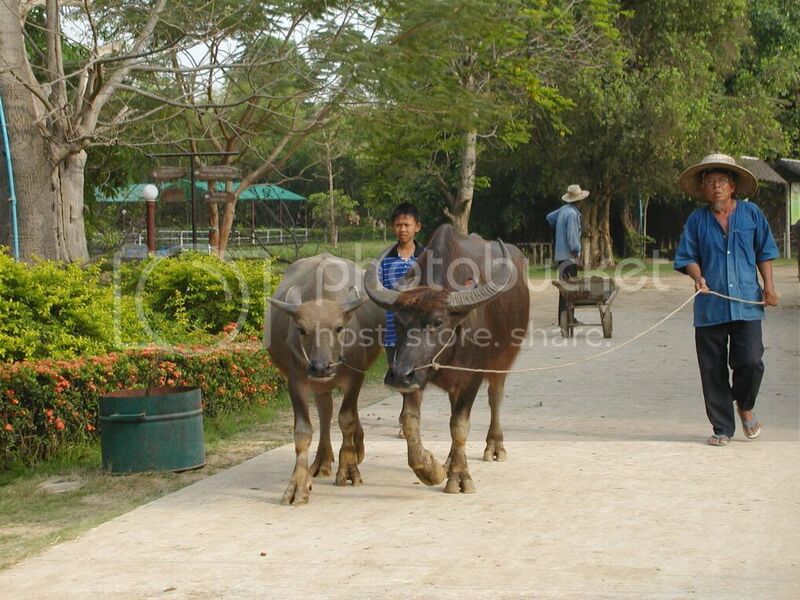 Buffalo Villages is located off of Highway 340, the main route through Sriprajan Subdistrict and Suphanburi Province. It operates from 9:00 AM to 6:00 PM daily. Admission for adults is 20 baht and for children it is 10 baht. Water buffalo are called “kwai” in Thai. It is extremely rude to refer to a person as a “kwai” because water buffalo have a reputation for being stupid and stubborn.